First off, I don't know where Eye-Fi got the idea that their product is the first Wireless SD card. Sandisk has released a wi-fi sd card years ago when WiFi wasn't a must-have on PDAs. 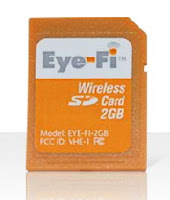 The headline of the Eye-Fi's press release read, "EYE-FI UNVEILS WORLD’S FIRST WIRELESS MEMORY CARD", now that is misleading. Now, if they append "for digital cameras", that would put a semblance of truth to their statement. Sandisk's WiFi card wasn't exactly built for digital cameras, it had an antenna so it protruded when inserted unto a PDA. But I guess Eye-Fi and Sandisk's memory cards are two different things. Sandisk's wifi memory card was really a wifi adapter for PDAs while the Eye-fi memory card...well, it's for those people who're too lazy to do all the transferring from their digital cameras to PC and then to a social networking site. Eye-Fi's 2GB wifi memory card is priced at $99.99. A new 2GB SD card only cost less than $20, so if you think that paying $80 more is worth it so that you don't have to waste precious energy transferring your photos, then by all means, go get one. Dropping by to say hi..How're you Natalie? Nice info about the wireless SD card..I wish there's a pair of wireless Bose headphones!